Garrafon Natural Reef Park is a terrestrial paradise of reefs and cliffs facing the turquoise waters of the Mexican Caribbean. Just 25 minutes from Cancun in the beautiful island of Isla Mujeres, this natural park is known worldwide for its beauty and incredible recreational activities like snorkeling, kayaking and ziplining. Come experience all that Garrafon Natural Reef Park has to offer and create amazing memories that will last forever. 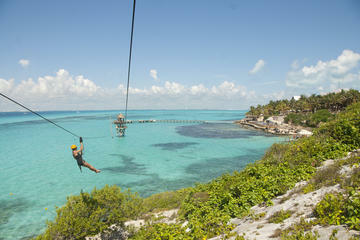 Set sail to Isla Mujeres from Cancun and spend the day relaxing and exploring at Garrafon Natural Reef Park. Your admission ticket includes recreational activities like snorkeling, kayaking, and ziplining; relaxation in hammocks, lounge chairs, infinity pool, and hot tubs; VIP amenities; breakfast and a buffet lunch; and drinks from the open international bar. Round-trip marine transport is provided from the Hotel Zone.